I have been home for five days, but couldn't seem to muster up the wherewithal to bake and blog!?! 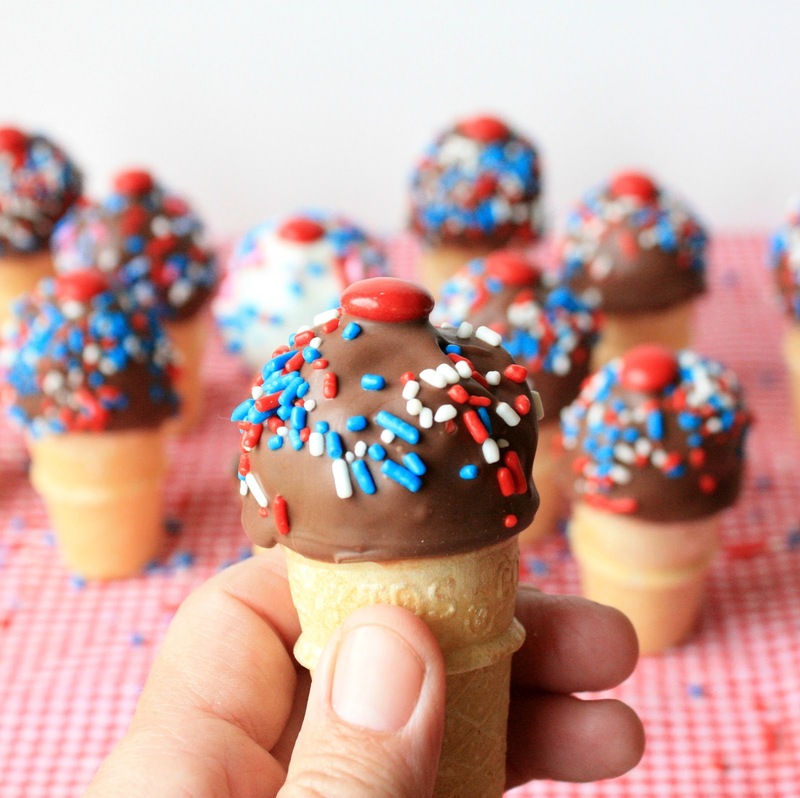 Then I remembered these cute little mini cones that flew home with me from Texas:) I bought them specifically to make faux ice cream cone cake pops. I found these cute sugar cone cake pops by Miss Candiquik awhile ago, and have been wanting to make some ever since. I'm so glad I did! Besides being yummy, they were a lot of fun to make and not too labor intensive. 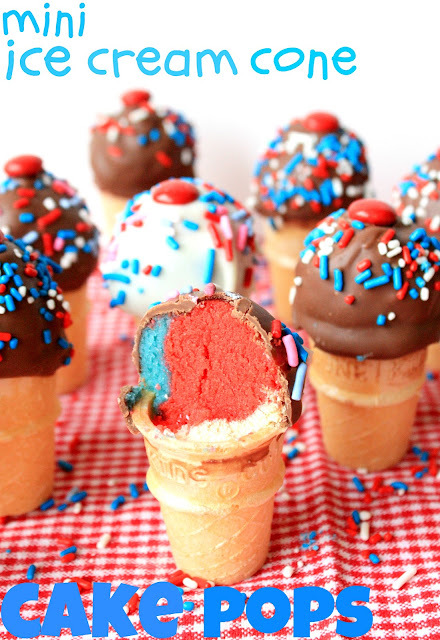 I know it might be too late to whip some up for Independence Day, but they would be a perfect treat for any summer day! Prepare cake mix and divide evenly into three separate bowls. Add a different color of food coloring to each bowl and mix thoroughly. Pour each into a separate, small cake pan and bake cakes according to package directions. Let cakes cool for 5-10 minutes in their pans, then remove from pans and let cool completely. Crumble each cake into fine crumbs and set aside in bowls. Add about 1/4 cup-1/2 cup of icing to each bowl and mix thoroughly. You want to add enough frosting to make the cake crumbs stick together, but not mushy. Set the cake balls on a wax paper-lined baking sheet and place them in the refrigerator to chill. According to package directions melt the candy melts in a deep dish. Remove the cake balls from the refrigerator and place on your work surface. Have the mini cones and sprinkles nearby. Dip each cake ball in the melted candy until completely covered. Decorate with the sprinkles and place the red m&m on top. Set aside to dry completely. ENJOY! *The issue that has consumed me of late is my son Jesse. About two weeks ago, out of nowhere, my 26 year old, otherwise healthy son, experienced a Transient Ischemic Attack (TIA), or mini stroke. It lasted about two hours. At the onset, he immediately went to the ER, where he was given lots of tests, and was released the next night. He has no risk factors, all of the tests proved negative, and he was not given any meds. Unfortunately, he went on to have two more TIA's within the next few days, though they were less severe, and shorter in duration. He now has more tests scheduled. He lives in another state so I feel sort of out of the loop. I pray and hope that the doctors will administer the correct test(s) and discover what the problem is so that it can be remedied. Sounds very yummy for this cone! Thanks. TIA's are scary...sure hope they find the cause soon! Those cones are so cute! And I hope your son is OK.
Oh Sue I'm so sorry to hear of your son's medical issues and can imagine how worried you and the family are. Praying right along with you that the correct tests are run so that the cause of Jesse's TIA's are determined and therefore, treated. That is a beautiful picture of him and his son's and your little mini 4th of July cones are sweet. Wishing you a wonderful Independence Day and sincere best wishes for Jesse and his young family in the days to come. Thank you so much, Paula. I appreciate your prayers and kind words. Sue, I'm so sorry to hear about your son. If I can suggest, have them look closely to his heart, even doing an echo cardiogram. We have a dear friend, she was 26 when she had a stroke, otherwise a healthy, marathon runner. After much testing, they found that one of her valves were narrow and cause blood clots to form. She's alive but with some disabilities due to the stroke, but the risk of more has diminished. Thank you, Susan. I appreciate the info. He is scheduled for a 24 hour EKG. Hopefully that will shed some light on the problem. Oh Sue. I have praying and thinking about your son and your family for the last few weeks. I hope that things are resolved and things get back to normal. We'll continue to pray. Best wishes to all of you. Keep us posted. Thanks for your kindness and prayers, Bonnie. Your cake pop icecreams are adorable and thank you for taking the time to share them even with everything that has been going on in your life. That is so frightening, Sue. No wonder you haven't felt in the mood to blog, or to bake. I'll keep all of you in my prayers. I have missed you and your blog posts, but completely understand why you had to take time off. How scary for you, your son and family. I will for sure be praying that the doctors will find the cause and will be able to treat him soon. Love the little cones, they will be a perfect treat anytime! My heart goes out to you and your family during this hard time my friend. Know that your son is in my wishes and I hope everything is ok.
*And these cake pops are SOOOOO cute! Btw, your cake pops looks so cute and delicious too, so perfect for the occasion. Happy 4th! Happy 4th of July to you and your gorgeous family Sue!! I hope the doctor finds out the real cause behind the stroke and Jess recovers soon! Big hugs,Sue. I know it's hard to watch loved ones go through medical issues, especially when so young. Your family will be in my prayers!! Sue I am praying for you. I can't imagine how it must hurt to not be near to your baby and your grandbabies during this time. Thinking of you and hope the docs figure out the cause. Heart stuff is scary, i definitely know that! Cones are so cute too! As a mother my heart goes out with you. I will be having your family and your son in my prayers and hope that everything turns out negative in those test. I'm so sorry to hear about your son. That is awful! You and your family are in my prayers!!! Thanks a lot, Erin! I found the mini cones at Walmart...Good luck! sending lots of prayers and good thoughts your way Sue! Thank you very much for your kind words! It's good to know I can contact you if need be:) You are so sweet! Thanks so much, Janet! I appreciate your prayers. mini cones?!? I need to get some of those! This is so cute... my girls would go nuts! 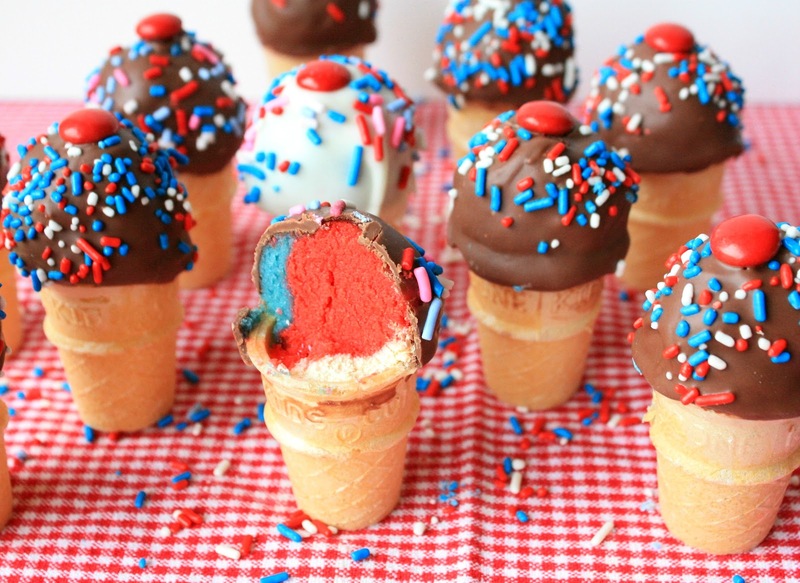 great ice cream cone pops, they are adorable. I hope your son is doing better and they find out what is wrong, that is so scary! Sorry this reply is so late! It's so good to hear from you; I miss your blog:( I assume it has been awhile since your daughter has been 23, so that is very encouraging. Thanks for sharing and passing on that information to me. Jesse hasn't had anymore episodes, but is still going through tests. Hopefully it won't happen again. With warm regards to you, your daughter and the rest of your family.